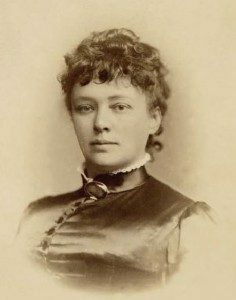 Bertha von Suttner is not a name you are probably familiar with, but she played a role in the 19th Century Feminist movement and, more importantly, was the person who persuaded Alfred Nobel to establish the Nobel Peace Prize. Yet curiously she only met Nobel briefly and the two could not have lived more different lives. 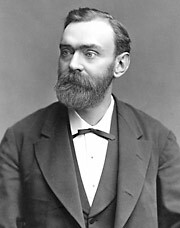 Alfred Nobel [1833-96] was a Swedish inventor and businessman. He was the son of an unsuccessful inventor and factory owner who encouraged his son to follow in his footsteps. He patented his first of more than 300 inventions- for a gas meter- when he was just 24. Nobel was interested in explosives. The main explosive at that time was gunpowder, which was unstable and could explode without warning. Nobel invented first Dynamite  and then the even better Gelignite . He had in mind that these safe explosives should be mainly used for industrial purposes, but of course it was the armies of Europe who made the most orders. Soon Nobel was a millionaire. Nobel was shocked when a French newspaper incorrectly reported his death in 1886 with the headline “The Merchant of Death is Dead”, going on to denounce him for making wars more destructive than ever. Nobel did not want to be remembered as a murderer, so he changed his will, leaving nearly all his fortune to be awarded to annual International prizes- including one for Peace. This was Bertha von Suttner’s suggestion. Bertha [1843-1914] was the daughter of a minor nobleman in Austria. She had a difficult childhood. After her father’s early death, her mother wasted what little money the family had gambling. Bertha married a poor nobleman Arthur von Suttner. For just a few weeks Bertha acted as Nobel’s Secretary when he visited Paris in 1876. However, although they never met again, they had become friends and exchanged letters regularly until his death. It was Bertha who persuaded Nobel to make one of his prizes a Peace Prize. By then Bertha was heavily involved in both the Feminist and Peace movements. From 1882 she was writing for various magazines and published her first Pacifist book in 1883. She followed this up with a Pacifist Novel ““Down With Weapons!” in 1889 which became an International Best-seller. Soon after she founded and led both the Austrian and German Peace Movements. She was also active in setting up the first International Court at The Hague in 1899, designed to persuade countries to use arbitration rather than war to settle quarrels. Her husband Arthur, whose own attempts at becoming a writer had not enjoyed success- died in 1902. Bertha now travelled widely in Europe and America, met various leaders including President Teddy Roosevelt, and also became increasingly involved in the Feminist movement. This was closely linked to her Pacifism. Not only did she state that women were equal to men, but she argued that if women were empowered, they could discourage their sons from playing with toy soldiers or joining the army. Bertha only had the one successful book, Down with Weapons, and was reliant on others for money throughout her life, but by her hard work and determination had become one of the best known Pacifists and feminists in Europe. She was herself awarded the Nobel Peace Prize in 1905, the first woman to receive the award – it would be another 25 years before another woman won the prize. Bertha was dying of cancer, but was busy organizing another Peace Conference that was due to meet in September 1914. It was not to be. She died on 21st June 1914. Just one week later Archduke Franz Ferdinand was assassinated and the First World War began. Naturally, all the warring parties made good use of the terrible weapon that Alfred Nobel had invented for them. Bertha’s work had been in vain, but she remains an inspiration to people who believe that mankind must abolish wars.